Shepard Smith did a great job covering the Mueller indictments. 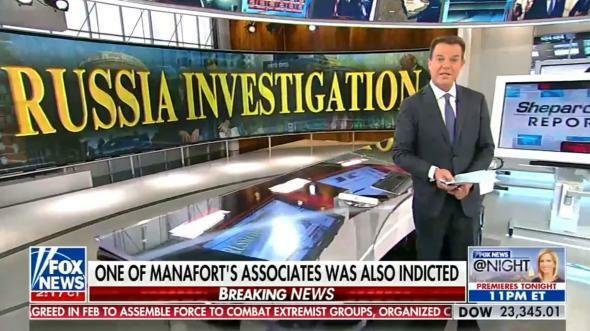 Fox News Did a Great Job Covering the Mueller Indictments. Then Shepard Smith Signed Off. In real life, being the only one-eyed man in the land of the blind doesn’t make you king. Shepard Smith Reporting, which airs at 3 p.m. on Fox News, is an outlier on the network: a personality-driven news show that emphasizes news over personality. Its host, the folksy Shepard Smith, is an anchor from another era, one in which watching the news did not make you want to stab your own eardrums with a pencil. Smith is an independent voice who seems committed to bringing his viewers accurate reporting and intelligent commentary. He exudes trustworthiness and decency. Smith’s show is, in a sense, both the least important and the most important program on Fox News. The show is important to Fox insofar as it gives the network plausible deniability. When critics accuse the network of being a one-note propaganda organ, it can point to Shepard Smith Reporting as proof that it sometimes varies its tune. But the thing that makes the program unique is also what makes it so deeply pointless. It often feels like Smith spends half of his time refuting the rumors peddled by some of his colleagues. The fact that his colleagues do not seem compelled to change their ways, or to live up to Smith’s good example, illustrates the show’s fundamental impotence. Breaking this morning, word that one of the president’s former foreign policy advisers has pleaded guilty to lying to the feds, misleading them about conversations with Kremlin insiders who claimed to have dirt on Hillary Clinton. And the president’s former campaign manager, Paul Manafort, and an associate of his pleading not guilty after a grand jury indicted them on felony charges, including conspiracy against the United States. Now President Trump is fighting back, asking why the feds aren’t instead focusing on Democrats and insisting there was no collusion with Russia. This hour, we’ll explain the case, the possible defense, and why this special counsel, Robert Mueller, this could be just a pit stop on a much longer ride. The charges brought against Papadopoulos, the former Trump campaign foreign policy adviser, are the ones most directly relevant to the president. While other Fox News shows led with Manafort and Gates in an effort to make it seem like the indictments were unrelated to Trump, Smith led with the Papadopoulos charges and, what’s more, proceeded to explain them to his viewers. Unlike the Gates and Manafort cases, Smith noted, the Papadopoulos case “directly relates to the Russia investigation and whether the Trump campaign had ties with Moscow. We circled Papadopoulos’ picture in a photo with then-candidate Trump, which he sent out last year, calling it a meeting with his national security team.” Later in the show, Smith and guest John Bussey of the Wall Street Journal took turns critiquing the Trump administration’s claims that Papadopoulos was a virtual nonentity in the campaign. That’s important! I also like how, when Smith introduced Bussey, he made sure to note that Fox News and the Wall Street Journal “share common ownership.” That’s the sort of thing real journalists are supposed to do. It is also the sort of thing that does not happen very often on Fox News. Paul Manafort, they used to call him “The Count,” because Paul Manafort, going way back, Trump met him in the mid-1980s. I think it was actually 1988 at the Republican Convention down in New Orleans. And since then they had had a friendship, and he was called “The Count.” And he was the guy on whom they were going to rely. Remember when it was everyone within the Republican Party, all Trump supporters were afraid that they were going to get to that convention and somehow [Trump’s opponents] were going to steal the convention? It was Paul Manafort’s job to come in there and turn votes into delegates. … He got in there, he ran that convention. Make no mistake. In Cleveland, Paul Manafort was in charge. No one will deny this. He was in charge of everything. First of all, the party and the candidate for whom Manafort was working was a pro-Russia, not pro-NATO, pro–United States—he was a pro-Russia candidate. And on fact, when he was ousted from office—Yanukovych was that candidate, that leader—that leader escaped to Moscow, where we believe he is in exile to this day under the protection of the Russians. … That’s the tick-tock on that, right? Not what [Manafort’s attorney] said, that he was trying to bring them closer to the U.S., but that he was fully aligned with Russia then later escaped to Russia. Take that, Paul Manafort’s attorney! Smith’s commitment to fact-checking would be admirable on any network. On Fox News, it can feel like a beacon. In real life, being the only one-eyed man in the land of the blind doesn’t make you king—it just means that no one else can see you. Smith’s good work started to come undone as soon as The Five came on the air at 5 p.m. “Paul Manafort, we’re finding out, was involved with shady dealings prior to the election,” said Greg Gutfeld at the top of the show. “In other breaking news, Kevin Spacey’s gay. I know, it’s all mind-blowing.” Better luck tomorrow, Shep.